This week we welcome Regional Director of Admission (West Coast) Ashley Brookshire to the blog. Welcome, Ashley! Have you ever watched a presenter on a raised surface, or a singer on a stage? Think about the space they leave between themselves and the end of the stage. Now, imagine that person chooses to pace on the very edge of the stage, rather than a safe distance back. I don’t know about you, but I would be much more concerned about that person walking themselves right off the edge of the stage than focused on their presentation. Because the speaker has positioned themselves in a place without margin, stress has now entered the situation for both them and the audience. 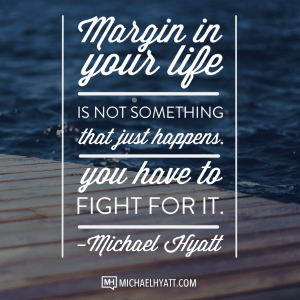 Margin is an essential part of our lives. Without margin we run right up to the edge. Once on the edge, our focus turns to simply staying upright, rather than paying attention to the quality and intentionality with which we operate. Breathing room is absolutely necessary in the college admission process! But if you don’t plan for it, you likely won’t have any. For those of you who are high school seniors, the college application process has already begun. Here are a couple of tips to help you set limits and expectations for the ride ahead—tips that will allow you to preserve margin around your college search process and decision. 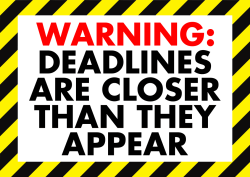 Did you know that the origin of the word deadline comes from the American Civil War? It referred to a line within prison walls beyond which inmates were shot. What a terrifying origin for a word that is now a part of our everyday language! As you can imagine, during the era when this term was making its debut prisoners probably left plenty of margin between themselves and the deadline. Fast forward about 150 years… these days we’re not very good at leaving margin between ourselves and deadlines. As the west coast representative for an east coast school, I’m often asked if our application deadline refers to 11:59pm ET or PT. If the answer to that question makes a difference in your plan to complete your application, then you are cutting things too close! 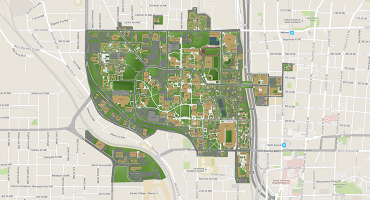 Last year at Georgia Tech more than 60 percent of our early action first-year applications were received within three days of our application deadline (that’s over 11,000 applications!). As more applications come in, the number of phone calls, emails, and walk-in visitors who have important, time sensitive questions increases. Needless to say, despite additional staffing, our response time during these few days of the year is slower than nearly any other time in our office. If you’re treating the deadline as THE DAY on which you plan to apply then you find yourself with a last-minute question, you’re welcoming unnecessary stress into your life as you anxiously await a response. The solution is simple: build in breathing room! When you see a deadline, give yourself a goal of applying one week in advance. Then if something unexpected happens, such as illness, inclement weather, or the internet breaks (true story—it’s happened in the past! ), you still have margin between yourself and the actual deadline. Back when my husband and I were engaged, we realized very early on we could not talk about wedding planning every waking moment. There was plenty to discuss, and each day we could spend hours talking about song lists, seating charts, and minute details. But the obsession of planning was exhausting. If we wanted to actually enjoy our engagement, and plan for a future far beyond our wedding day, we had to set limits on when we discussed wedding plans. I strongly encourage you and your family to do the same for your college search process. If you set no limits to college talks, then you all will inevitably burn out. A time of discovery and maturity will be marred with talking about details that are subject to constant change. You’ll find yourselves rehashing the same conversation over and over and over again, but with different levels of emotion and stress. There are important things for you and your family to discuss, and you certainly need to have dialogue around the college process. Just don’t make it part of every conversation you have during your senior year. Find the best time for you all to sit down each week and talk (sound familiar? It should!). Maybe you agree not to talk about college on the weekends… or before school… or maybe you only talk about it on a designated day. Do whatever makes the most sense for you, but make sure you’re setting a framework around when these important, but exhausting, conversations take place. Leave margin in your day and your conversations so college talk doesn’t permeate all aspects of your life. Breathing room is valuable in many aspects of life, but in the frenzy and significance of the college process, we often lose sight of it. Keeping margin in the picture can substantially reduce the amount of stress you carry during this season as you keep your head above the chaos. Take a deep breath, make a plan, and use this unique time to determine what things matter most to you.